All items in this image are linked below, accordingly. With each season comes new trends, and some that seem to hold on for yet another round. While there are some trends that I will happily add into my closet, there are some that I could do without. Along with those trends are basics that I feel everyone should have when the fall season rolls around. Some of these items could even be used year round, not just for the fall season! I’ll share with you all what I feel are pretty basic fall items that if you don’t currently have in your wardrobe, you should consider. Happy shopping! I have chatted about this time and time again. So much that you all may be sick of hearing me talk about it! I am telling you though, this is a must. You can get a utility jacket in so many different styles-long, shorts, hooded, not hooded. Plus, it can be worn over so many different outfits from distressed jeans and a tee to a casual dress. To me, this can be somewhat of an investment as you will wear this so much. Similar to the Utility Jacket, this is something that can be worn over and over again. I love to pair my moto jacket with a flirty dress to give it a little edge. It also pairs really well with jeans and a tee. One of my favorite all time looks is distressed jeans, a plain white tee, and a moto jacket. Something so simple yet stylish about it. 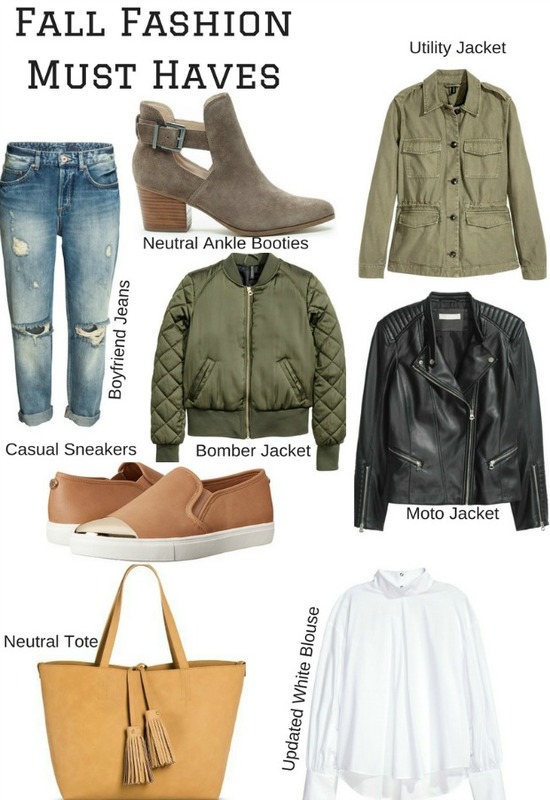 What’s great about moto jackets is (like utility jackets) you can get them in varying styles and colors. You can’t go wrong with a basic black or cognac jacket, but there is something a little feminine about a pastel pink moto jacket, too. This is something that you could safely spend a decent amount of money on, because it is something that won’t go out of style. If spending a lot isn’t your thing, there are plenty of faux leather options as well. I seem to be on a jacket kick, don’t I? While this style of jacket is a bit more on the trendy side, I feel as though it can be a great basic to have on hand. You can pretty much get a bomber jacket in any color, print, or price range. I love this particular trend because it is a nod to the 90’s. Like that fashion era or not, it is here to stay! (expect to see a lot of velvet this season). A bomber is similar to the utility and moto jackets in that you can toss it on over anything and everything. I feel like the change of season is a great time to take an inventory of what you have in your closet and what you might need. Now is a good time to snag a pair of boyfriend jeans if you don’t already own a pair. I like this style because the fit is intended to be a little looser, which is a breath of fresh air from all of the skinny jeans in our closets. I particularly think they look great with a cute pair of sneakers or ankle booties. You can’t go wrong with a pair of these, ladies. I have several pairs in different styles, and they get worn every single year. Stacked heel, flat, perforated, open toe-there are so many different styles. While it can be fun to add a little color with your booties, I suggest sticking to a neutral pair. You will get so much more wear out of them. They pair well with anything from dresses to jeans! I could live in sneakers. I am also thankful that the sneaker trend is sticking around for yet another season. I prefer wearing a cute pair of sneakers any day over a pair of heels. They literally come in every color or print you can imagine so it’s not hard to find a pair that suits you. I swear, just when I think my purses can’t get any bigger, they do! A tote is a great ‘throw all’ for anything you need to tote (no pun intended!) around. I love how much they can hold, and how easily they can match just about any outfit. Like the booties, I suggest going with a neutral so it can be easily incorporated into your day to day wardrobes! Every gal should own a white, button up blouse of some sort. Take the opportunity this fall to update your basic white blouse. Purchase one that you know you will wear, but give it a little twist, whether it be ruffles, a white on white print, or a delicate cutout. Something like a white blouse can be worn with quite a bit, whether it be a pair of slacks or a pencil skirt for work, or a pair of distressed boyfriend jeans and a moto jacket for girls night out. Get a little bold with your white blouse this season and ditch the basic button up! Head to your closet and compare it to this list- do you have everything? Does what you have need a little updating? Like I said, all of these are items that are super easy to incorporate into what you already own! What would you add to this list of fall basics?